AHMEDABAD: Overexploitation of groundwater resources and over-reliance on chemical pesticides and fertilizers is leading to rise of life-threatening chemical contaminants in groundwater beyond acceptable limits. 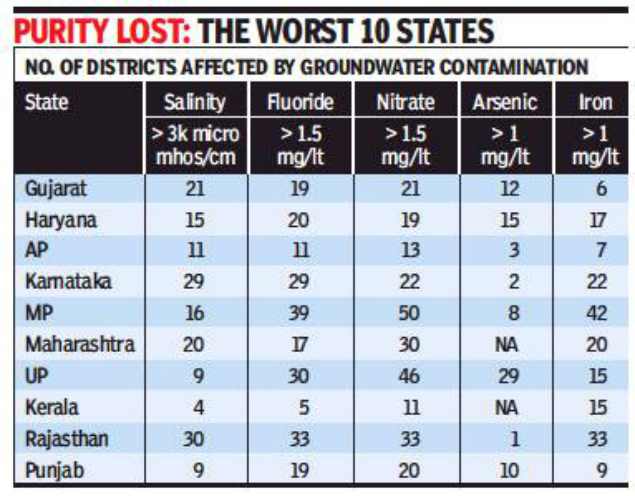 The central ground water board (CGWB) figures presented by Union MoS water resources, Arjun Ram Meghwal, in the Lok Sabha recently, suggests that 21 districts of Gujarat have reported issues of high salinity levels, 19 districts have reported high fluoride content, while 21 districts have high nitrate presence in groundwater. About 12 Gujarat districts have reported high arsenic and six districts have reported high iron content. The same report also suggests that Gujarat has consumed 68% of its groundwater resources already and that the rise in these chemical contaminants is partially because of this reason. A press release by ministry of water resources has quoted drinking water standards by WHO (2011) where fluoride should not be more than 1.5 mg/litre and nitrate should not be more than 50 mg/litre. The Bureau of Indian Standards (BIS) has set a limit for fluoride that is same as WHO and for nitrate it is 45 mg/litres as against 50 mg/l prescribed by WHO. A research team led by professor Rohit Goyal from the department of civil engineering, MNIT Jaipur claims that nitrate pollution is caused by intensive use of nitrogen-based fertilizers and crop irrigation with domestic sewage water. Nitrogenous fertilizer rapidly converts into nitrate form in soils. When quantity of nitrogen added to the soil exceeds the amount that the plants can use, the excess nitrates does not get adsorbed by soil particles and hence leaches out from the root zone by water percolating through the soil profile and ultimately accumulates in the groundwater. In case of fluoride, the BIS has set a limit of 1 mg/litre in drinking water, which may be extended to 1.5 mg/lt as permissible. The favourable factor which contributes to rise of fluoride in groundwater is presence of fluoride-rich rock salt system in the state. “Fluoride enters soil through weathering of rocks, precipitation and impure water, mainly from waste run-off,” states Goyal.